In the first section dealing with prehistory and proto-history of the ancient Indian civilization, we will be reviewing the story of one of the four oldest world civilizations. This civilization is unique in that it is a living vibrant civilization as its thoughts, teachings and traditions are still practiced by vast number of people in the Indian sub-continent grouped under the term ‘ Hindu’s. The land is more aptly be called as ‘BharathaVarsha’ (Bharat -in short). We will be recounting the fascinating story of the Sarasvati river and the Aryan civilization which originated, developed and left a mark on the world. This civilization is a river valley civilization and should be aptly called as Sindhu-Sarasvati Civilization. The Sarasvati river itself was a life line of Aryan civilization and features prominently in Rigveda suktas. So much this civilization was dependent on the bountiful abundant flow of Sarasvati river, that nourished vast territories of land that the river itself and its name was deified as a Goddess. True to the spirit of Aryan civilization, the river goddess was not named for her bounty and material riches that she provided; but for knowledge and enlightenment of the people who depended upon her. It was a vast river along with its tributaries. It’s flow and volume was gigantic – it’s width at points exceeding ten to twelve kilometers. We should not be using past tense to describe this river, perhaps we subconsciously think of Sarasvati as a river of past, as it no longer flows as a regular river. But Sarasvati indeed lives in her proven riverbed, confirmed by many archeological explorations and vividly pictured by satellite photography. Many scientists of the world, both from India and other countries – prominent among them from France, UK, Europe, Germany have contributed to the growing knowledge about this river. And in a sense have resurrected the ‘mythical long lost dormant river’ of Vedic age, providing evidence not only to the time and life of Rig-vedic age, but to mythology itself. What is mythology? As Michael Danino puts it : “a ‘myth’ is a complex multilayered legend, which weaves together heroic deeds , divine miracles, and through powerful symbols imprints a set of values on the mind of the people” . ….. “the myth in turn becomes inseparable from the people and their customs and traditions” . This is how he explains how the two great epics –Ramayana and Mahabharata are living realities in India and are enacted through festivities in hundreds of citadels and villages, every year. This river due to geo-physical cataclysms shifted its course; ran an interrupted course and vanished in to dessert land. Thanks again to archeological evidence and satellite photography; its full underground terrain has been mapped and is being miraculously restored multiple projects in modern India, transforming today’s desert land in to green pastures of yester years. Many people are under the misapprehension that Sarasvatiriver is discovered recently. One who is familiar with the archeological research work, know that discovery of Sarasvati river dates back as early as 1812. Lt. Colonel James Todd was the pioneer in this work. In one of his papers, sketch of the Indian desert, he unearthed the evidence of numerous towns and hamlets in the sandy desserts of Rajasthan being scattered and suggested that de-population occurred in this area due to deficiency of water. From this point, several archeological research evidences added the vital pieces of jig saw puzzle to reconstruct the course of the ‘lost mighty river’. The work by no means is complete. This section connects the discovery of the Sarasvati river with a reconstructed timeline. During the colonial era and early years of independent India, the prevailing opinion suggested the march of a tribe of European origin termed ‘Aryan’s, who established the Aryan civilization in India and in terms of time not later than 2000 BCE. This theory is debunked by most of the later evidence based work, which confirms that Aryans and Dravidians were native habitats of India. A few die-hard western academics, for reasons and motives known only to them are yet to be persuaded to the reality of the new evidence and findings. This evidence is briefly reviewed through special articles drawn from the important work by distinguished researchers and archeologists like Dr. B BLal,S. P.Gupta, Mishra and Bist, Kalayanaraman, Michel Danino and Nagaswamy. References are given to important contributions from abroad by researchers like Allchin and team, Bridge, Raymond and Cassal, Elstov, Poshehl (- Writing systems) and Bryandt ( Indo Aryan Controversy) and many other distinguished researchers. This section also contains a review of the contents of rigvedic and purana-texts, not only in the context of time lines, but as a part of evidentiary account of mythological stories such as ‘ Sage Parashuram’s sojourns to various parts of India, as described in Ramayana; Balaram’s pilgrimage to various holy sites as described in Mahabharta. Our exploration is extended to the legends and events in Buddhist and Jain era’s, to supplement the continuity of the timeline. References are also made to trade and commerce and mari-time activities of ancient Indian society, which perhaps explain many of the footprints of Aryan civilization beyond India. Position of Sanskrit as the language of the Sindhu-Sarasvati civilization is also reviewed. Effort is also made with the use of graphics to describe the incomparable sites of Sindhu-Sarasvati civilization which includes the sites of Harappa, Mohenjo-Daro, Nalanda, Dwaraka under sea finds, and many related recent finds. A number of infomercials, satellite imagery, archeological finds and their significance, numismatics, inscriptions, evolution of scripting, iconography – are included in this section. A brief article also reviews the evidence built around the astronomical data brought to light by notable researchers in astronomical science. In closing, this section vindicates what has always been believed I the land of this ancient civilization that the Vedic era predated the reference anchors of Gregorian calendar marked timeline, at least by three millennia, if not more. Finally this section gives a list of important publications for further reading and research. Ancient Indian history is a minefield of inexact datelines, controversies, strongly stated views, differing interpretations of available archeological evidence, myths but not withstanding perplexities and clarity, it makes an overawing and fascinating story. The reason for this state of affairs is to be sought in the history of land when recordings of history began. As stated in general introduction, Indian subcontinent has gone through frequent invasions, conquests, colonialism, and interruptions of its recorded history. The tradition of passing on knowledge from revered teacher to the devoted pupil was not through the writings on a media like papyrus, but primarily through the voice tradition. This indeed was the first hurdle. It’s great antiquity, despite all the controversies itself was a factor because most of the resource materials such as epics mythologies and puranas were so old that physical evidence of their veracity is practically not verifiable. If written history was not emerging from the source books of Indian thought, for what-ever reason, one has to fall back to see whether archaeological evidence can help any better in this construction. Here again, there are major hurdles. The main hurdle being, the entire archeological researching organizations were regulated by the colonial frame of thoughts[i] and constructs. Archeologists and interpreters of early manuscripts and source books ought to be highly principled scientists. But world of colonial era was a different world than world of science today. There is hard evidence that the empire did not want one of its colonies to have a history and an advanced civilization which predated its own religion mandates and beliefs. A brief outline of the contents of this section is as follows. – The quest of a myth (A journey from a myth to reality) by Dr. Narasimhan and Jayashree. The story of Sarasvati River recounted in the first article by Dr.Narasimhan and Jayashree, is further presented graphically and with evidence compiled, in the following presentations and articles by Michael Danino. The same is presented with authors permission. a) Discovering the Sarasvati: From 1855 to 2014 by Michael Danino. d) Revisiting the Role of Climate in the Collapse of the Indus-Sarasvati Civilization by Michael Danino. What then is an acceptable timeline of this great Sindhu Sarasvati Civilization? 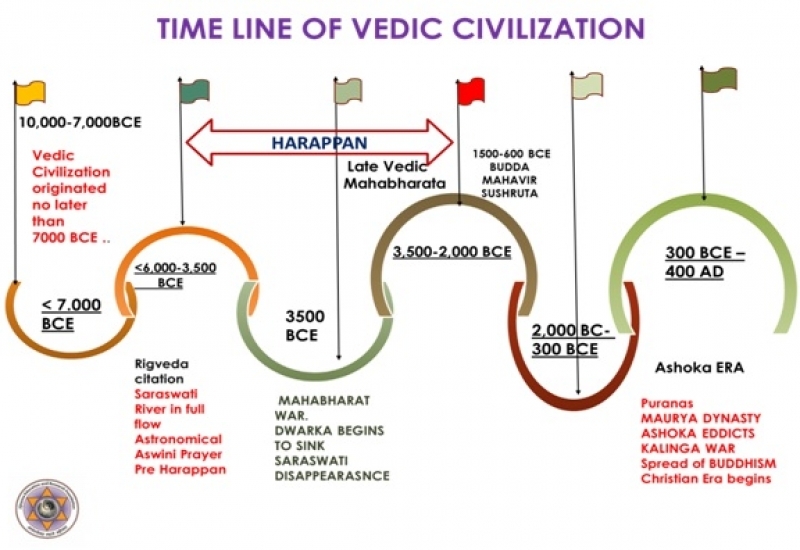 The articles presented in this section tend to suggest that the origin of Vedic civilization predates the early Harappanera , perhaps as old as 7000 BCE or earlier. The subject is by no means non-controversial and there is no way by which a final date can be scientifically established. We present here a graphic diagram that we believe can reasonably be derived from various streams of evidence.